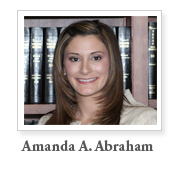 Amanda A. Abraham is senior associate with the Roth Law Firm, where she practices commerical and business litigation. Since joining the firm in 2006, her primary area of practice has been focused on intellectual property litigation representing both plaintiffs and defendants. She has appeared as counsel of record in over 150 civil cases in federal court. Amanda dedicates much of her spare time to the Texas Young Lawyers Association, where she serves on the board of directors, currently as treasurer. Since joining the Board in 2013, she has spear-headed and participated on many TYLA projects including: Strength In Unity, TYLA’s Justdrive campaign BSAFE, End Bullying Now, the Minority Law Student Scholarship program, and launch of TYLA’s mobile website. As a third generation Marshall native, Amanda enjoys serving her community and is involved with many local civic organizations. She graduated from Texas A&M University in 2002 with a Bachelors of Science degree in Journalism with an emphasis in Public Relations and a minor in Business Administration. In 2006, Amanda earned her Doctor of Jurisprudence degree from South Texas College of Law.